From the main dashboard, click on the “new proposal" button. Select an existing client from the drop down menu, or click on “add client" to add a new one. 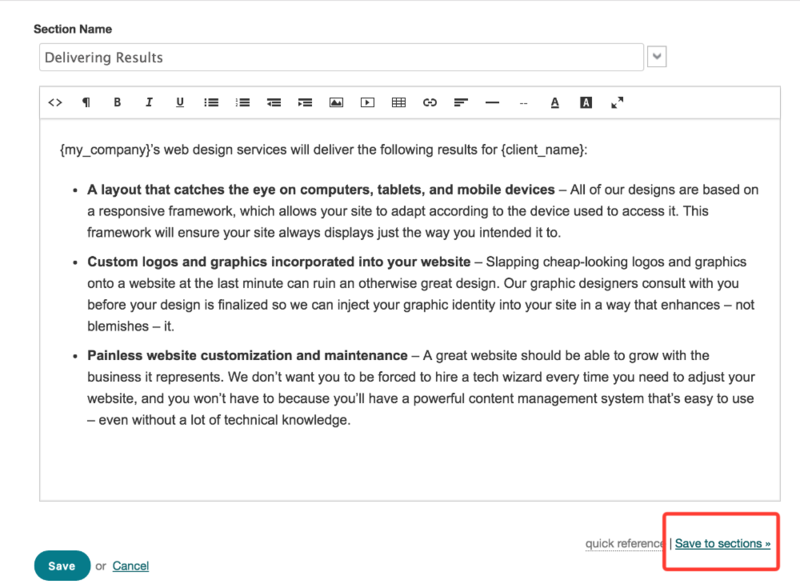 Enter the project name, and select a template from the drop down menu. When you're done, click “continue." Customize the “goals and objectives" section first by clicking “edit." This will take you to a modal with the editor. Here, you can make all of your edits. 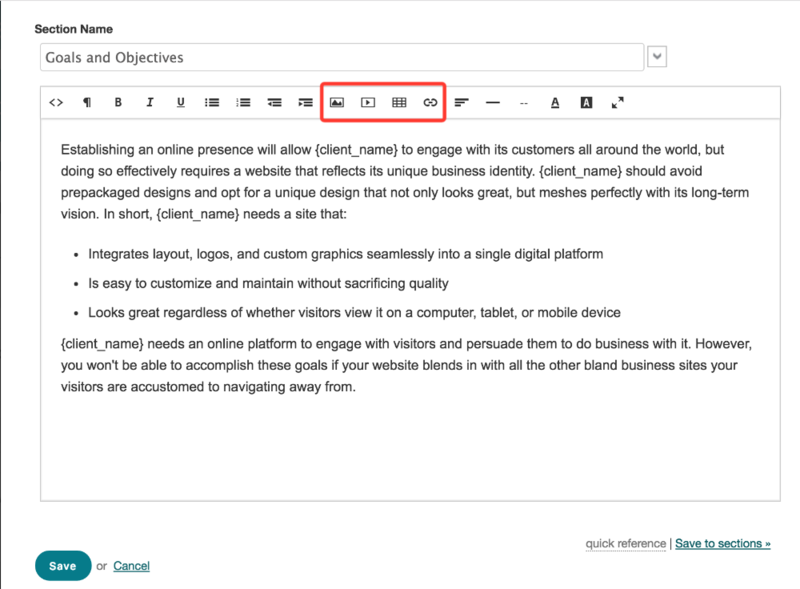 The toolbar in the editor lets you format text, add links, images, and more. When you're finished, just click on the “save" button, and you're done. 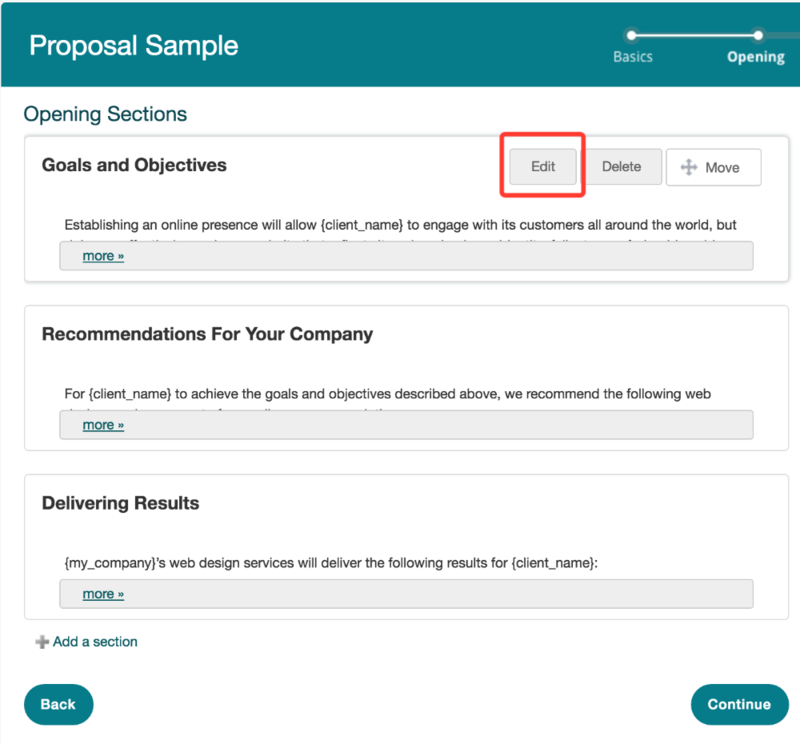 Click on the “add section" button to add another proposal section. You can either select an existing section from your account, or create a new one. 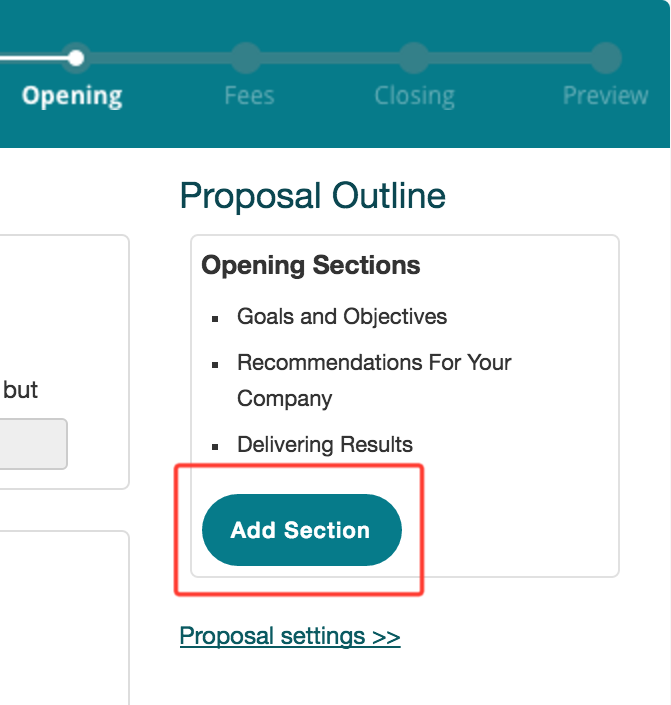 Once you're done editing, you can save it to your account to make it available on any proposal, by clicking on the “save to sections" link. 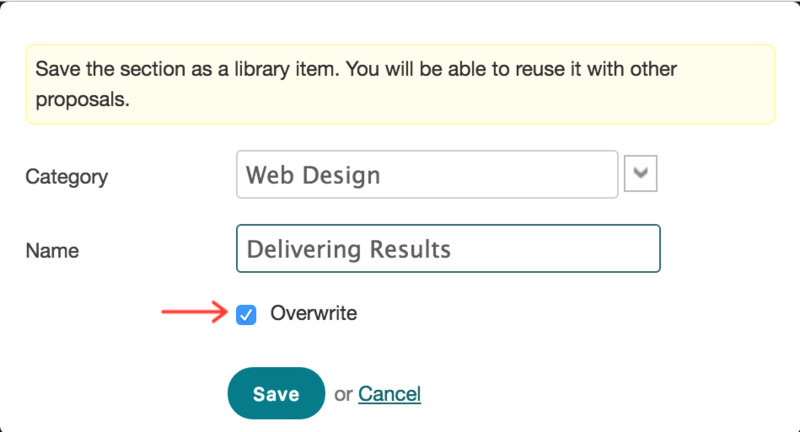 If it's an existing section, any edits you make will be saved to the version in your Sections if this “overwrite" box is checked. When you're done with your sections, click “continue." Adding fees works a lot like the sections do, except that you can also enter an amount. 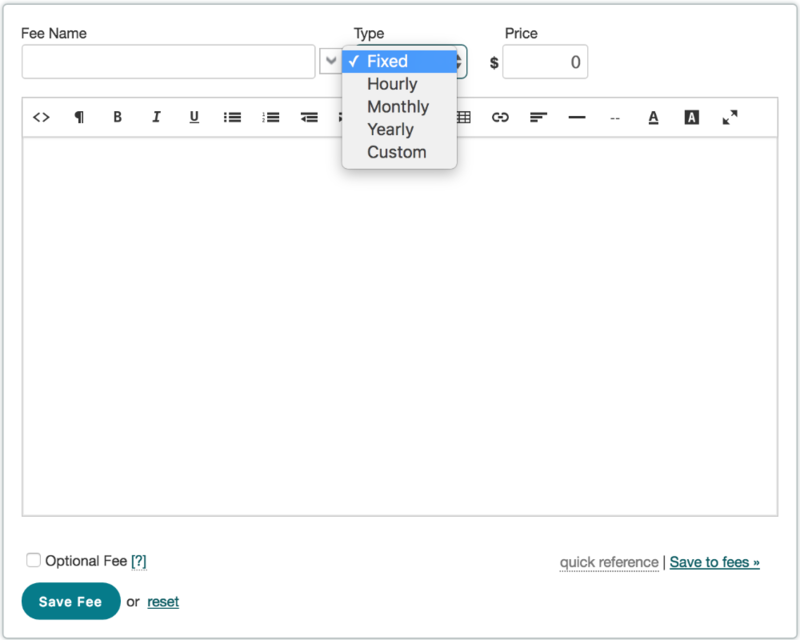 You can select an existing fee and edit, or create a new fee. There are a few fee types available to you: fixed, hourly, monthly, yearly, and custom. Select the type of fee you want, and include your price. 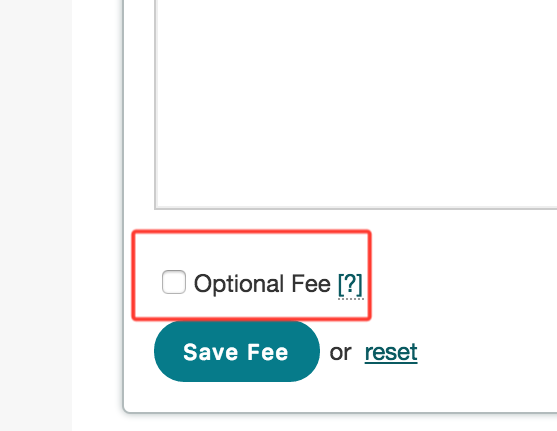 You can make a fee optional by clicking the “optional fee" checkbox. 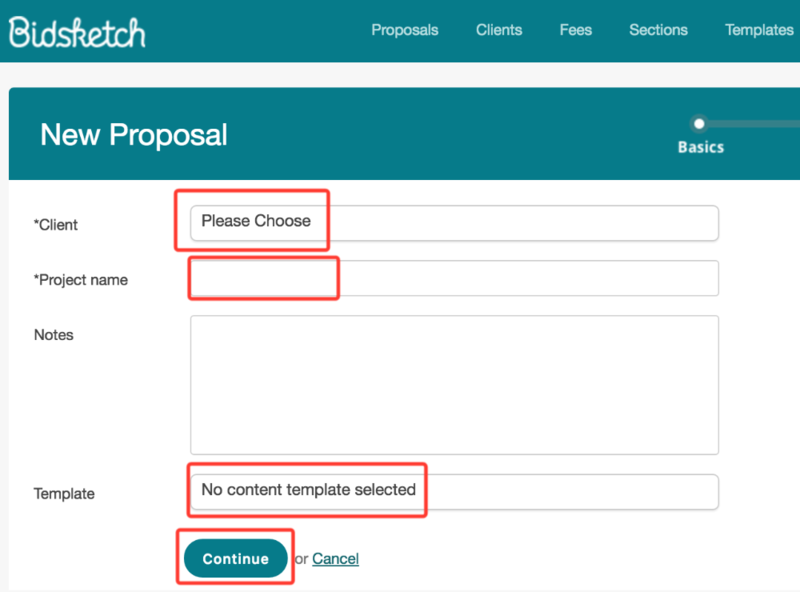 Your client will be able to add or remove the fee when they view your proposal. If you have any taxes or discounts to include, enter those here. When you're done, click “continue." We're going to skip ahead to the proposal preview page. This is where you'll make your customizations. (There's another article on how to do that.) You can view and download the PDF of the proposal by clicking on the “view as PDF" button. When you're done, click “save proposal." Now you're ready to send the proposal to your client. 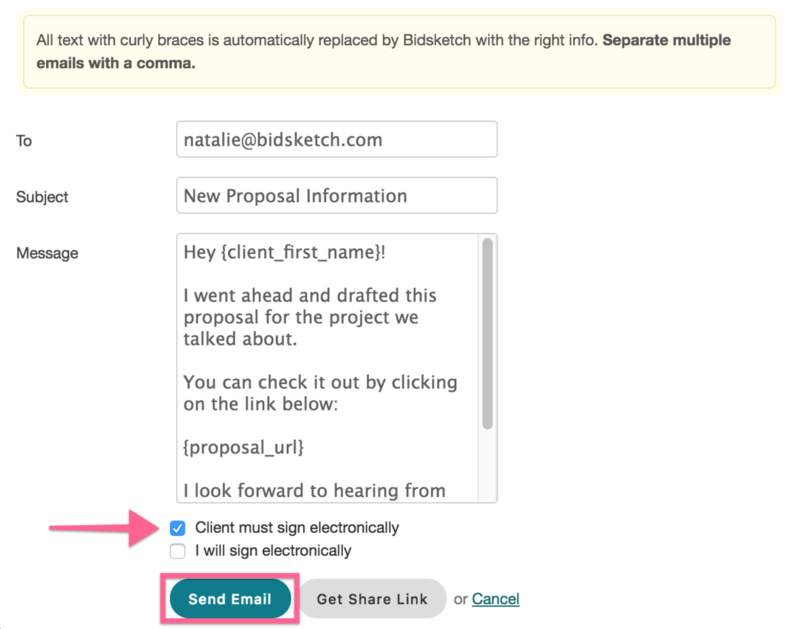 To send your proposal, click on the “send proposal" button from the proposal details page. You can add additional emails if you'd like, just be sure to separate them with commas. If your plan includes the electronic signature feature, check off who should sign the proposal. Now click “send email" and you're done!